Now through March 30, 2014, AZ Spring Break at Lake Havasu will host a month-long party packed with daily events and music. 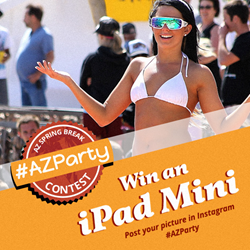 Guests can even win an iPad Mini with AZ Spring Break’s Instagram contest. AZ Spring Break at Lake Havasu is kicking off their 2014 spring break season with an awesome photo-sharing contest. AZ Spring Break, at the London Bridge Resort on Lake Havasu, recently announced their entertainment lineup and March event calendar to include national recording artists, live DJs, exclusive pool parties and much more. From sunup to sundown, AZ Spring Break at Lake Havasu guarantees non-stop activities and events to keep the party going all month long. During the day, guests can enjoy playing beach volleyball, hanging by the pool or even combatting the undead with zombie paintball. And when the stars come out, get ready for more – the on-site Kokomo Beach, Surf and Party Bar hosts the hottest-spinning live DJs each night, sure to get you in the dancing mood. Plus, throughout the month of March, the main stage at Kokomo’s proudly presents performances by national recording artists: Baby Bash, Tech N9ne, LV Sharp, Far East Movement and Sky Blu! TNT Tuesdays – Enjoy food and drink specials, featuring tacos and tequila, that are hot, hot, hot! Wet Wednesdays – Head over for great drink specials, games and grooving on the infamous wet dance floor. Walking Dead Paintball Maze – Shoot zombies as you traverse through a haunted maze. Facebook Social – “Like us” (we know you do) to receive even more great drink specials! AZ Spring Break at Lake Havasu is kicking off their 2014 spring break season with an awesome photo-sharing contest. Using the hashtag #AZParty, guests are encouraged to strike a pose and post their most flattering spring break pictures to Instagram. Winners will go home with a new 16GB iPad Mini! Participants are welcome to be spontaneous with their photos, but are advised not to submit anything inappropriate. Click here to get more information and the official contest rules about this exclusive Instagram contest. London Bridge Resort is located on beautiful Lake Havasu in Arizona. For more information on booking an affordable 2014 spring break package, visit: http://www.azspringbreak.com or call 866-331-9231.